AW3D is the world’s first and the most precise 3D map covering all global land spaces with 5 meter resolution. In urban area, even 3D data with 0.5 meter resolution is available. AW3D is the world’s most precise global 3D map covering all global land spaces with 5 meter resolution, developed and sold jointly by NTT DATA and Remote Sensing Technology Center of Japan (“RESTEC”). This service also distributes highly detailed 0.5 meter to 2 meter resolution versions of 3D map utilizing satellite images from DigitalGlobe. Since the completion of the global coverage By completed global coverage in 2016, NTTD along with RESTEC have been able to provide the 3D map data anywhere in the globe with short delivery time and highly competitive price. For instance, the 3D map made from satellite imageries reduces the cost to a quarter of that of a conventional method that uses aerial photographs, and also minimizes the lead time to one week. It makes the use of this service possible in emerging countries particularly in Asia and Africa, in various fields including map creation, disaster prevention, power plant in the electricity sector, mining-field inspections in the natural resource sector, infectious disease prevention in the hygiene sector, and urban and facility planning. AW3D has been utilized in emerging countries particularly in Asia and Africa, in various verticals including map creation, disaster prevention, power generation plant development, mining exploration the natural resource sector, disease containment in the hygiene sector, and urban and facility planning. Thanks to the wide coverage and high-precision of the dataset, various product lineups, and our global customer support network, AW3D has been utilized in more than 900 projects, over 115 countries and creating new markets of elevation model utilization. The dataset has been contributing efficiency and sophistication of disaster prevention measures, natural resource, urban planning, electricity development and communications services in the global market. AW3D will be provided combining with business applications as total solution to customers as well as the current dataset provision service. 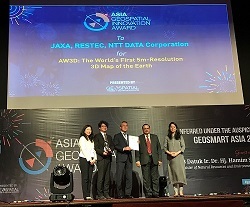 A global high-resolution 3D map, AW3D won the “Asia Geospatial Technology Innovation Awards 2017” at the “Asia Geospatial Excellence Awards” held by Geospatial Media and Communications in Malaysia. The Nikkei Superior Products and Services Awards handpicks about 40 new products or services of particular excellence every year out of the products or services released that year, which amounts to about 20,000 items. The Space Development and Application Award is an award system for honoring the achievements of cases that have made significant contributions to furthering space development and utilization, such as pioneering initiatives that have enjoyed major success in advancing space development and utilization.